Greek Joker is a popular lottery in Greece that features huge jackpot that has no cap. It also offers 7 other consolation prizes every draw. Match the 5 main numbers and 1 Joker number in order to win the jackpot prize. The Joker number is significant all throughout the various prize categories, increasing your chances of winning. 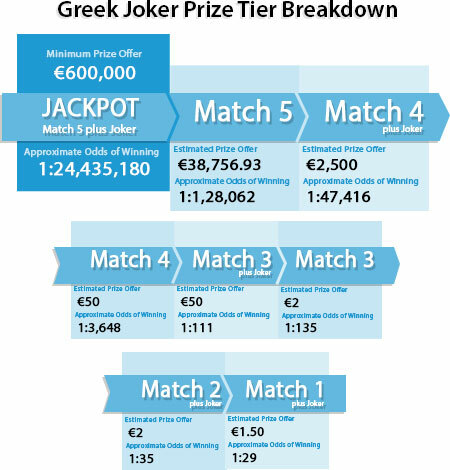 Greek Joker Lottery draw happens two times a week - Thursday and Sunday evenings in Greece. Choose 5 main numbers from 1-45 and 1 Joker number from 1-20. You can also play with auto-generated number by clicking “Lucky Pick”. Choose your draw days. You can either play for Thursday or Sunday draw or choose to play for both draw days. Select your weeks. You can play for the upcoming draw or play for multiple future draws. Check your selection carefully then click “Check Out” to submit your form. "After placing an order with us, you will receive your OneLotto official ticket(s), which can then be viewed within your “My Account“ page. Once the winning numbers and the prize breakdown have been officially announced, OneLotto will publish and upload the results onto our website. We will also send out to all participating Players a full result email. Winning ticket holders will receive a notification email from us. Thereafter, you may withdraw your winnings using your “My Account” page."